Help Evolved raise awareness and support for breast cancer, while making you and your loved one feel cherished. 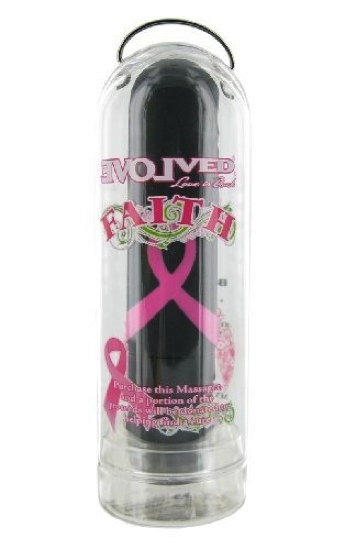 Whenever you purchase this massager, you are helping to find a cure for breast cancer. A portion of the proceeds will be donated to the Save the ta-tas Foundation. Did you know? The physical and emotional side effects of cancer and chemotherapy can cause women to lose their libido. According to Chemocare.com many doctors recommend touching exercises, cuddling and exploration to help partners boost their sexual relationship. True multi-speed. Powerful motor. Easy push button control. Waterproof. Made from body safe ABS. Phthalate and latex free. Covered in a sensual satin smooth coating. Maximum intensity with minimal noise. Clean with mild soap and water or toy cleaner. Requires 1 AA battery.